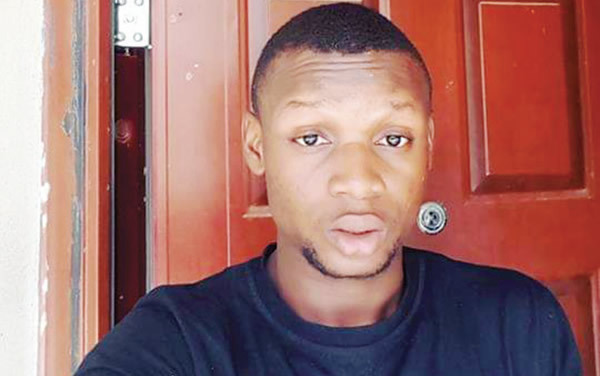 The family of a serving member of the National Youth Service Corps in Lagos State, Abdulrafiu Imam, has asked the NYSC and the police to intensify the search for him. Imam, a graduate of Mathematics from the Federal University of Technology, Minna, Niger State, went missing on December 24, 2018, after he left the apartment he shared with a friend at the Military Barracks Yaba. Imam’s sister, Kehinde Lawal, told our correspondent that his roommate, who was not around when he left the house, told the family that Imam had shown signs of depression lately because of a sprained. She said, “I don’t know what led to his disappearance, because we don’t stay together; he stays in Lagos, while I stay in Ibadan. All we know is that we had been trying to reach him on his phone days before Christmas and his number indicated that it was switched off, and this got us worried. “His roommate told us that he went to the Redemption Camp and by the time he came back, he saw my brother’s phone, wallet and clothes in the room and concluded that he had gone out to buy something. “But his roommate became apprehensive after waiting for two days without seeing Imam. One of my brother’s friends, who had been calling his phone without luck, called the roommate, who told him he had not seen Imam for some days and that is how we have been looking for him since then. “His roommate told us that Rafiu (Imam) had been depressed lately and we did not know anything about it. He did not inform us. Rafiu sprained his shoulder sometime ago and his roommate said anytime he looked at it, it made him sad. Lawal added, “When he came to my place in Ibadan before going for the NYSC programme in Lagos, I saw the arm and where the ball and socket ought to be was not where it was. I took him to the University College Hospital in Ibadan, but the resident doctors were on strike and I told him to go to the hospital as soon as he got to Lagos. Our correspondent learnt that Imam’s disappearance was reported at the Lagos Island Police Station. Lawal urged anybody with useful information on Imam’s whereabouts to report to the nearest police station. Imam’s uncle, Abdulsalami Ishaq, said the family had visited all possible places that he might be. Ishaq stated, “We reported the case at the Sabo Police Station and they sent a signal to their control room and all police stations in Lagos State were radioed. We the family members, have personally visited 15 detention centres, general and teaching hospitals and morgues, all to no avail. “We visited the NYSC secretariat and we met the assistant director, who promised to send a letter to the Lagos State Commissioner of Police, and subsequent follow-up showed that they have done that because when we called them, they said they had submitted the letter to the CP. Ishaq urged the NYSC to do more in finding Imam than what it was doing currently. When contacted on the telephone, the Lagos State Coordinator of the NYSC, Prince Mohammed Momoh, refused to make any comment on Imam’s disappearance. “I don’t do newspaper interviews; I don’t answer questions on the phone; if you want to interview me, come to my office. If you want any information, come to the secretariat,” he said. The spokesperson for the Lagos State Police Command, Chike Oti, said the command was intensifying the search for Imam, adding that he would soon be reunited with his family.